A weak upper low centered over SW Mediterranean and makes some progress towards east. A new upper trough with a frontal system affecting western Europe. A SLGT+ risk has been issued for southern UK into NW France and parts of Benelux with threat for heavy rain, severe winds and some tornado threat. Area will be monitored for possible upgrade into MDT risk on DAY 1. A SLGT risk has been issued for Sardinia, Corsica, Sicily, Tyrrhenian sea and large part of western Mediterranean sea with threat for heavy rain and waterspouts. 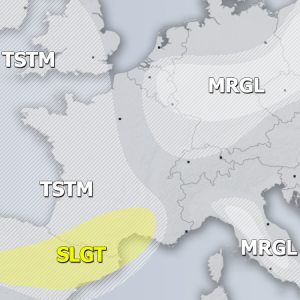 A SLGT risk has been issued for NW Iberia with threat for heavy rain and severe winds.